AJMAN, United Arab Emirates, Dec. 10, 2018 /PRNewswire/ — Team AquaGreen, representing Ajman University (AU) in the United Arab Emirates, won top honors in two separate categories in the prestigious Solar Decathlon competition held Nov. 14-28, 2018, in Dubai. AquaGreen earned first prize in “Engineering and Construction” as well as “Energy Management,” and was the only team from the Middle East to dominate in multiple categories. 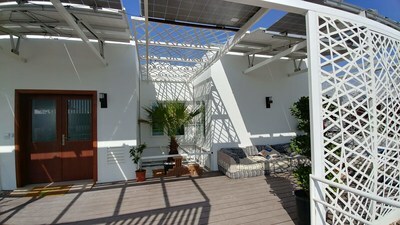 The Solar Decathlon is an extremely competitive and challenging international competition. Established through an agreement between the Dubai Electricity and Water Authority and the Department of Energy in the USA, the Solar Decathlon invites students from universities all around the world to design and build a solar, sustainable, zero-CO2 emission, smart house. Earning an opportunity to participate in the event is highly selective. This year, 15 teams were chosen to showcase their creations. AU’s team of 61 students – led by College of Engineering faculty members Dr. Sahar Kharrufa, Mrs. Sahar Makky and Mr. Iyad Abdaljawad – worked diligently for 18 months to design and construct their house on AU’s campus before building it on the Solar Decathlon site in Dubai. Two team members lived in the house throughout the two-week competition during which time it was constantly tested for emissions and efficiency. AquaGreen’s approach was to design a home that would be suitable for the UAE and similar arid conditions. The students focused their efforts on solving the most pressing regional sustainability problem – air-conditioning energy consumption – using materials common to the Middle East. The system they created resulted in a 60 percent conservation of cooling energy. Founded in 1988 as the first private institution of higher education in the GCC, AU is now listed by QS Rankings among the top 1,000 universities in the world.